Home » Academics » Schools » School of Science, Engineering and Technology » Faculty » David Turner, Ph.D.
David Turner received his Ph.D. in geology from the University of Utah, with a concentration in geochemistry. Prior to joining the St. Mary’s faculty full time, Turner was a staff scientist at Southwest Research Institute, with more than 20 years of experience in addressing a wide variety of environmental issues. 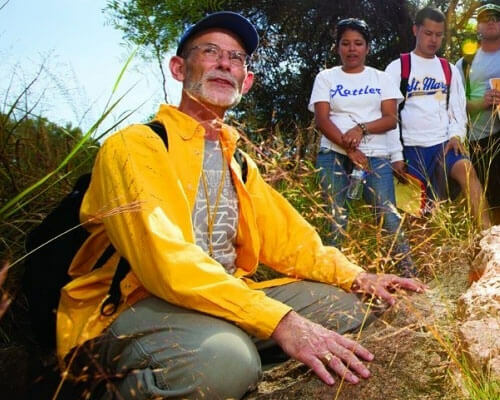 Beginning in 1998, he also served as an adjunct faculty member at the University of the Incarnate Word, Trinity University and St. Mary’s University, teaching introductory courses in geology and environmental science. During graduate school, Turner’s research focused on reconstructing the geochemistry of hydrothermal zinc ore deposits near Silver City, New Mexico. With summer experience in the western United States that included gold exploration, evaluation of geothermal potential and exploring for oil and gas resources, Turner completed his studies at the University of Utah with a well-rounded understanding of how the geosciences can be applied to solving real-world problems. After graduation, he accepted a position at Southwest Research Institute, where he studied the geochemistry of radionuclide transport. He also led and contributed to a successful program to evaluate potential environmental impacts associated with nuclear fuel cycle facilities. He has authored or co-authored more than 100 journal papers, book chapters and reports on a wide range of geochemistry and environmental topics. He serves as a peer reviewer for many academic and professional journals, and has presented research results at national and international meetings to a wide variety of audiences, including professional societies, industrial and government clients, elementary school and university students, teachers, and members of the general public. Turner, D.R. and J.R. Bowman. 1993. Origin and evolution of skarn fluids, Empire zinc skarns, Central Mining District, New Mexico, U.S.A. Applied Geochemistry 8: 9-36. Turner, D.R. and S.A. Sassman. 1996. Approaches to sorption modeling for high-level waste performance assessment. Journal of Contaminant Hydrology 21: 311-332. Pabalan, R.T. and D.R. Turner. 1997. Uranium(6+) sorption on montmorillonite: Experimental and surface complexation modeling study. Aqueous Geochemistry 2: 203-226. Turner, D.R., R.T. Pabalan, and F.P. Bertetti. 1998. Neptunium(V) sorption on montmorillonite: An experimental and surface complexation modeling study. Clays and Clay Minerals 46: 256-269. Turner, D.R. and R.T. Pabalan. 1999. Abstraction of mechanistic sorption model results for performance assessment calculations at Yucca Mountain, Nevada. Waste Management 19: 375-388. Contardi, J.S., D.R. Turner, and T.M. Ahn. 2001. Modeling colloid transport for performance assessment. Journal of Contaminant Hydrology 47: 323-333. Wang, P., A. Anderko, and D.R. Turner. 2001. Thermodynamic modeling of radionuclide adsorption on selected minerals. I: Cations. Industrial and Engineering Chemistry Research 40: 4,428-4,443. Wang, P., A. Anderko, and D.R. Turner. 2001. Thermodynamic modeling of radionuclide adsorption on selected minerals. II: Anions. Industrial and Engineering Chemistry Research 40: 4,444-4,453. Goldberg, S., L.J. Criscenti, D.R. Turner, J.A. Davis, and K.J. Cantrell. 2007. Adsorption-Desorption Processes in Subsurface Reactive Transport Modeling. Vadose Zone Journal 6: 407-435. Werling, B., and D.R. Turner. 2010. A Method for Preparing for and Executing Conflict of Interest Assessments. Environmental Practice 12: 168-174. Turner, D.R., T. Griffin, and T.B. Dietrich. 1993. Radionuclide sorption modeling using the MINTEQA2 speciation code. C. Interrante and R. Pabalan, eds. Materials Research Society Symposium Proceedings: Scientific Basis for Nuclear Waste Management – XVI. Pittsburgh, PA: MRS: 783-789. Turner, D.R. and S.A. Sassman. 1994. Approaches to sorption modeling for high-level waste performance assessment. Proceedings of the Fourth International Conference on the Chemistry and Migration Behavior of Actinides and Fission Products in the Geosphere – Migration ’93. Munich, Germany: R. Oldenbourg Verlag: 745-756. Turner, D.R., A.C. Bagtzoglou, and J. Foegelle. 1995. Characterization of the potential for perched water development at Yucca Mountain, Nevada. Proceedings of 6th International Conference on High-Level Radioactive Waste Management. La Grange Park, IL: American Nuclear Society: 72-74. Turner, D.R., R.T. Pabalan, P. Muller, and F.P. Bertetti. 1995. Uniform surface complexation approaches to radionuclide sorption modeling. Proceedings of 6th International Conference on High-Level Radioactive Waste Management. La Grange Park, IL: American Nuclear Society: 234-236. Pabalan, R.T., D.R. Turner, F.P. Bertetti, and J.D. Prikryl. 1998. UraniumVI sorption onto selected mineral surfaces. E.A. Jenne, ed. Adsorption of Metals by Geomedia. New York, NY: Academic Press, Inc.: 99-130. Turner, D.R., R.T. Pabalan, J.D. Prikryl, and F.P. Bertetti. 1999. Radionuclide sorption at Yucca Mountain, Nevada – Demonstration of an alternative approach for performance assessment. J. Lee and D. Wronkiewicz, eds. Materials Research Society Symposium Proceedings: Scientific Basis for Nuclear Waste Management – XXII. Pittsburgh, PA: MRS: 583-590. Pabalan, R.T., D.R. Turner, and M.P. Miklas, Jr. 2000. Technetium-99 chemistry in reduced groundwaters: Implications for the performance of a proposed high-level nuclear waste repository at Yucca Mountain, Nevada. D. Shoesmith and R. Smith, eds. Materials Research Society Symposium Proceedings: Scientific Basis for Nuclear Waste Management – XXIII. Pittsburgh, PA: MRS: 231-236. Turner, D.R., F.P. Bertetti, and R.T. Pabalan. 2002. The role of radionuclide sorption in high-level waste performance assessment: Approaches for the abstraction of detailed models. Soil Science Society of America Proceedings Volume: Soil Geochemical Processes of Radionuclides. pp. 211-252. Turner, D.R., R.T. Pabalan, and F.P. Bertetti. 2006. Applying surface complexation modeling to radionuclide sorption. F. Lützenkirchen, ed. Surface Complexation Modeling. Amsterdam: Elsevier, Ltd.: pp. 553-604. Turner, D.R. 2012. Decommissioning of Nuclear Facilities. Encyclopedia of Sustainability. Springer Verlag. (in press). Turner, D.R. 2001. Radionuclide Sorption: Abstracting information from detailed models for High-Level Nuclear Waste Performance Assessment. Invited Presentation. Nationale Genossenschaft fur die Lagerung Radioaktiver Abfalle (NAGRA) Geochemistry Workshop, October 28-30, 2001. Wettingen, Switzerland. Turner, D.R. 2002. The role of geosciences in nuclear waste management. Invited Presentation. Trinity University Department of Geosciences, February 11, 2002. San Antonio, TX. Turner, D.R., and L. Canter. 2004. A Short Course on National Environmental Policy Act Document Review. Kentucky Transportation Cabinet, May 25-27, 2004. Frankfort, KY.
Turner, D.R., and P. Mackin. 2004. A Short Course on National Environmental Policy Act Document Review. U.S. Navy Engineering Field Activities Northwest, September 21-23, 2004. Poulsbo, WA. Pabalan, R.T., D.R. Turner, and F.P. Bertetti. 2004. Radionuclide Sorption in High-Level Waste Performance Assessment: Abstraction of Results from Experiments and Surface-Complexation Models. Workshop on Conceptual Model Development for Subsurface Reactive Transport Modeling of Inorganic Contaminants, Radionuclides, and Nutrients, April 20-22, 2004. Albuquerque, NM. Turner, D.R., F.P. Bertetti, and R.T. Pabalan. 2005. Developing Thermodynamic Radionuclide Sorption Models: Experimental and Modeling Results. Invited Presentation. Nuclear Energy Agency Radionuclide Sorption Workshop, October 10-11, 2005. Paris, France. Turner, D.R., F.P. Bertetti, and R.T. Pabalan. 2005. Applying Radionuclide Sorption Models in Performance Assessment. Invited Presentation. Nuclear Energy Agency Radionuclide Sorption Workshop, October 10-11, 2005. Paris, France. Turner, D.R. 2006. Making a Living in Science and Engineering. Invited Presentation. University of the Incarnate Word, College of Mathematics, Science, and Engineering, September 29, 2006. San Antonio, TX. Turner, D.R., and D.A. Pickett. 2008. Overview of the United States Regulatory Framework for In-Situ Leach Uranium Milling. American Association of Petroleum Geologists Annual Meeting, April 20-23, 2008. San Antonio, TX. Turner, D.R. 2008. Environmental Impact Assessment: Disciplined Analysis in a Multi-Disciplinary Context. Invited Presentation. Sigma Xi, Alamo Chapter, May 20, 2008. San Antonio, TX. Turner, D.R. 2011. Uranium Mining and the Nuclear Fuel Cycle. Invited Presentation. Southwest Gem and Mineral Society. February 10, 2011. San Antonio, TX. Mitchell, E., D. Fitzgerald, and D.R. Turner. 2011. Silicate Minerals: Nature’s Building Blocks. Poster Presentation. Southwest Gem and Mineral Society, Fiesta of Gems. March 19-20, 2011. San Antonio, TX. Sobery, A., D.R. Turner, and E.J. Mitchell. 2012. Development of Earth Science Hands-On Exhibits for STEM Enrichment at the Elementary Level. Geological Society of America, South-Central Section – 46th Annual Meeting (8–9 March 2012). Alpine, TX. Hernandez, Ashley A., and D.R. Turner. 2014. The Potential Effects of Fireworks on Woodlawn Lake, San Antonio, Texas. Geological Society of America, South-Central Section – 46th Annual Meeting (17–18 March 2014). Fayetteville, AR.